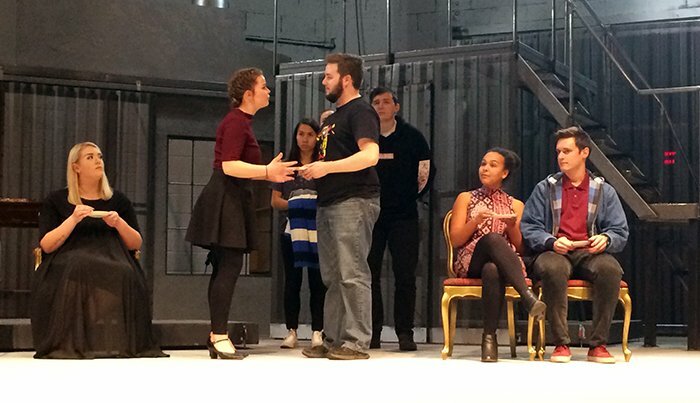 Barbara Undershaft (Christine Ward, second from left) gets reacquainted with her estranged father, arms dealer Andrew Undershaft (Cameron Cluff, third from left, foreground) in Ethington Theatre’s production of “Major Barbara,” opening Friday. Barbara Undershaft has more than just a minor problem. Her father, Andrew Undershaft, is a big-deal arms dealer who knows he can bend the world to his will. Money and power will do that, and Undershaft touts plenty of both. Those ideas run counter to that of his daughter, Barbara, a woman of privilege, thanks to her dad, who hasn’t seen his estranged family in so long he claims he doesn’t know which are his own children. Barbara prefers to spend her time at the Salvation Army helping the poor and is determined to elevate the plight of mankind with good-hearted deeds. Here’s the pickle Barbara will find herself in: When her father aims to donate money to the Salvation Army, should she take it, knowing how the money was made? 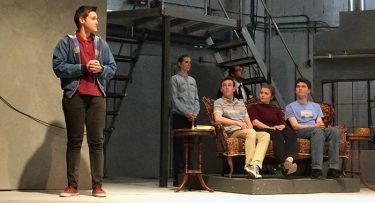 It’s a conundrum explored in the latest Ethington Theatre production, George Bernard Shaw’s classic 1905 satire, “Major Barbara.” The play will run Feb. 9-11 and Feb. 16-18 at Grand Canyon University. “Major Barbara” is one of Shaw’s livelier comedies. It’s plucky. It’s effervescent. And it’s just plain funny, peppered as it is with not just slapstick comedy but pages of witty banter. Yet the playwright – he is perhaps most well known for “Pygmalion,” on which “My Fair Lady” was based – doesn’t sit on his comedy laurels. While his chatty characters (including a professor of Greek) keep audiences entertained with their quips and quick wit, Shaw doesn’t fail to delve into some deep themes. Shaw explores the idea of how one truly effects change. Is it by doing what Barbara does, which is volunteer to help the poor, or is it taking Undershaft’s approach, which is to use his considerable power and money to really move the needle forward? Kary said Undershaft doesn’t quite look at the problem of poverty as his daughter does. While Barbara is a humanitarian who looks to God for strength in finding the answers, her father thinks, ultimately, money and power will make a big impact. “Mr. Undershaft says it better than me. He talks about how this problem (poverty) has been with us for centuries, and all our sermons and articles haven’t done anything to help,” Kary said. He aims to kill poverty rather than help the poor. He added that “Major Barbara,” in addition to exploring wealth vs. poverty, is very much a class play. Shaw explored class differences in “Pygmalion” and how societal tiers even permeate language, and he does the same here. “It pokes fun at being rich and being poor,” he said. Of course, there are the ethical considerations, too. Is it ethical to take money even though that money may be dirty? 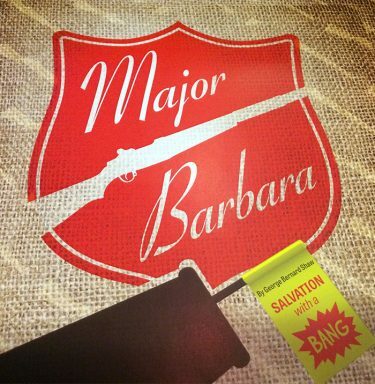 In the satire “Major Barbara,” a daughter wonders whether she should accept the help of her arms dealer father in supporting a cause close to her heart, the Salvation Army. Cluff said how Shaw builds this major character is unique. Every patriarch of the family is adopted and takes on the name of Andrew Undershaft, so each patriarch is an outsider and has something to prove. During the course of the play, Undershaft tests each of his children and observes what a life of prosperity has done for them and if they, too, have something to prove in their lives. It is in Barbara, seemingly the child most far removed from his beliefs, that he sees value. “He’s disappointed most of the time, but he does see quite a bit of ability and ambition in Barbara, and that’s why she’s his favorite,” Cluff said. Although that empathy seems to contradict the lifestyle of an arms dealer like her father, in the end she comes to realize she and her dad want to both help, but in different ways. So it is Barbara who evolves the most during the course of the play. “There’s a big change in her character,” Ward said, noting that Barbara goes from being above her father’s power and wealth to realizing that empathy isn’t the only thing that can make a difference in people’s lives. Beyond those major themes, Kary spoke of the big challenges in bringing “Major Barbara” to the stage — the sheer amount of dialogue the cast has to memorize and how they present that language, which the director describes as elevated and beautiful. Audiences will hear a peppering of accents, from Scottish to Cockney. Kary said he hopes the play, despite being written more than 100 years ago, will feel contemporary and relevant. “It should feel very familiar to us,” he said, speaking about the modern bent in the costumes. Plus, its themes should feel relevant to audiences today. “The disparity in wealth in that 1905 time is very, very similar to the disparity in wealth we have right now,” he said. Still, with all that elevated language, all the characters and all the deep themes, in the end “Major Barbara” aims to entertain and keeps the comedy rolling. Shaw, said the director, is able to do that because he puts these deep themes in very human terms. “Humans are funny, and the people in this play are so smart. It’s fun to watch them work this thing out right in front of us because it’s hard to find the right answer,” Kary said. Tickets: GCU students get one free ticket with their student ID. Otherwise, tickets are $12 each. Discounted tickets available for senior citizens, military personnel, GCU employees and alumni, GCU students, and children 12 years old and younger. For tickets, click here. Information: Call 602-639-8880 or email. You can reach GCU senior writer Lana Sweeten-Shults by email at lana.sweeten-shults@gcu.edu. Follow her on Twitter @LanaSweetenShul.